Busjack may be on to something. I know it's 9pm at night, but looking at all the north routes on Webwatch, nearly all of the buses running were 6100s. No early 6000s at all, in fact only 6033 and 6066 (former West bus) were out. Could be foreshadowing. That, or, depending on how many buses that Northwest or River might need for the I-90 project, fleet reallocation. I'm not going on rotjohn's theory, in that I physically saw 6004 yesterday on 270. However, it was rush hour. I'm going on the theory that drivers would not be trained on new equipment unless it were showing up shortly. Similarly, I'm not going on the I-90 theory since construction on the Elgin to Rosemont portion isn't scheduled until 2015. However, there is still the official discrepancy between the number of buses in the 2012 budget (156) and the number said to be delivered in the first order (69) by the end of May. Seeing as though NW has the oldest (and newest) of the 6000s, it will be interesting how the retirement and replacement process will pan out. Depending on how many more Eldorado Axxess buses are coming, NW seems to be the next logical choice of getting new buses. However, West still has some 6000s, so the question becomes will there be Orion swapping between NW and West (with West receiving some in the higher 61xx range to retire West's 60xx buses. Then there is the question of SW, which all of their 40Ft buses are also 6000s. After you factor in South supposedly in line for CNG buses in the not to distant future, we could be in for a lot of bus shuffling. Seeing as though NW has the oldest (and newest) of the 6000s, it will be interesting how the retirement and replacement process will pan out. ....After you factor in South supposedly in line for CNG buses in the not to distant future, we could be in for a lot of bus shuffling. Especially since, even if the white NABIs may be slated for retirement by the time South gets the CNGs, the blue ones won't. Send them back to West???? Maybe we can have a contest over which division (other than the all EZ Rider ones) will have the first complete blue fleet. The other thing that could happen is Pace West could continue to receive Axxess buses to eliminate all of its Orions. If nothing else, Pace West would lead the contest with Blue buses in that scenario. Actually, they lead in blue buses now. The thing that might support that is if the numbers I cited above are correct, there are 87 Axess buses still to be delivered, and the Pace budget indicates that there are 85 2000 Orions. IIRC, the first order was for 88 (there are three scrapped ones) and the first option buses were somewhat in the middle of SW division deliveries, although the demarcation was not clear then. In that case, those approximately up to 6088 would be slated for replacement, which would clear out W, but only half take care of NW and SW, if there were a replacement in place. Then the rest would have to be covered by shifting NABIs from South, at least for the short term. I would say NW, strictly because so far PACE doesn't seem to want to put NABI's there, and what else does that leave NW with in the future, if there are no more Orions? "This year, the goal is to expand service on two existing buses — Route 600 between Schaumburg and Rosemont and Route 610 between Rosemont and Prairie Stone in Hoffman Estates." Assuming bi-directional service and potential disconnections to existing interlines, I am placing a bet on NW getting more 40' buses. Whether they are the O6's or the Axesses is another question. O.K. I was, in effect, resting more on the next sentence with regard to the 2016 plan for the full blown service, or some implementation of that as congestion relief during construction. In the 610 situation, I wouldn't count on much as the route includes deadheads. The current schedule has 3 (a.m.) or 4 (p.m.) as expresses. 600 might be more, because now it is only a reverse 606 on some trips. In that when Colonial was operating 610, they used motor coaches, there might be some idea to put the Axess Express buses there. 6647 is back at West. It was on the 310 on Friday morning. No they should be West, but the lower #6280's are south. Unless something has changed. 6290-6302, 6304-6312, 6314-6316 are at West. I haven't been to Waukegan much lately (This is a very good thing! ), but is North the only all white bus division now? I don't think there are any blue units there yet, but curious if any other divisions have all white buses, and no blue (or green) buses yet. That appears correct. All except W and S have 2600s, and those two have blue NABIs and Axess. Currently, #6285's on the #331, #6287's on the #319, #6289's on the #307, #6284 is south on the #353, #6269 is on the #364 and I'll bet #6279 is south too, but it never appears on the tracker. 2743 was at Aurora in December. e-saw it on the 524. Has is returned to Joliet? 6614 is at NS e-seen on 620 last Monday. The Orions at HP are 2830/1 not 2831/2. Do you or anyone else know if #6317 is south or west? I removed the Orion I's from NS. They are have been off the property for a few months, I had said they were black striped on the apron 6/15/13. Updated everything else, thanks guys!! BTW, I wonder when NW is getting more Axess'? They seemed to stop cold at #6399. Has anyone determined yet how many we are getting? Funny, they mentioned they are getting 13 MCI's in a press release, but there has been no press release on this yet. 6317 should still be at West. I believe that was one of the buses that had the Sprint bus wrap a few weeks ago over there. I know they've now been removed, but maybe there was a painting issue with this bus. Good news: I finally got to ride an ElDorado Axxess on route 290 tonight . 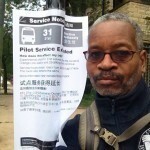 Bad news: I only rode between the Howard "L" and Damen/Rogers AND I forgot the vehicle number. I can say that it was NOT 6323 meaning Pace Northwest is running more of these buses on #290. I had only seen 6323 on #290 previously.